DVD review: Actor Rod Taylor, former boxer and lifesaver, pulls no punches | Daily Review: Film, stage and music reviews, interviews and more. As an all-purpose Australian leading man of the 1950s through to the ’70s in Hollywood, Rod Taylor was the natural screen successor to Errol Flynn. Flynn has maintained legendary status despite or because of his scandalous private life as well as his sparkling performances on screen, inspiring many biographies and biopics. Meanwhile, the impressive acting career of Taylor, who died in 2015 at the age of 84 after appearing in more than 50 feature films, has been neglected. The DVD/VOD release of Rod Taylor – Pulling No Punches is a welcome corrective as well as being a thoroughly entertaining documentary. The film is not a negative portrayal of Taylor in any sense. In addition to clips from Taylor’s films, the film includes interview footage with an engaging and candid Taylor filmed not long before his death. There is expert input from Taylor’s biographer Stephen Vagg, who has published the only full-length account of Taylor’s life and career. Several notable actors who worked with Taylor speak in Pulling No Punches as well as others working in the film industry in Australia and overseas who admired the man and his work. Rod Taylor was not the product of a posh drama school but had done a few different different things and seen a bit of life. Flynn and Taylor belonged to different generations, though they played a range of not dissimilar big screen roles, from romantic comedy through to Westerns and war films, from pirate epics to contemporary thrillers. Taylor arguably played a wider variety of characters than Flynn, who died at 50. Unlike Taylor, or, for that matter, Chips Rafferty in Wake in Fright (1971), Flynn never got to play an old man for all that he was aged prematurely by his choice of a relentlessly dissolute lifestyle. Flynn’s career was constrained by working within the studio system at Warner Brothers and limited for the most part to working with certain directors and co-stars. By contrast, Taylor’s career, which commenced a few years after Flynn’s death in 1950 and saw him work with a range of directors including Alfred Hitchcock, John Ford and, in his final performance he played Winston Churchill in Quentin Tarantino’s Inglorious Basterds (2009). We learn from Pulling No Punches that Taylor, among others, was considered by producer Albert R. Broccoli to play James Bond, a role Taylor rejected much to his subsequent regret. It is not hard to imagine Taylor excelling in that role. Like the similarly hairy-chested Sean Connery, Taylor could be both personable and ruthless, suave and brooding. Unlike some of the actors who have played Bond between Connery and Daniel Craig, Taylor, who preferred to do his own stunts, looked and moved as though he really could do the physical stuff required of the character. There are actors who may not win awards or garner critical accolades but they do win the hearts of cinemagoers who just want to enjoy seeing them on the screen. Throughout his movie career, Taylor also worked in television and indeed came to the attention of Hollywood after starring as an expatriate American journalist with a taste for adventure in the pot-boiling series Hong Kong (1960-61). In his prime, Flynn was almost impossibly handsome, while Rod Taylor came across as more of a regular guy. Bright-eyed and with a wide smile held in place by a strong jaw, there is an open faced, slightly rough-hewn look about Taylor – a certain down to earth, can-do quality that he seemed to project. He was a good-looking bloke, on whom, it seems there were no flies. There are actors who may not win awards or garner critical accolades but they do win the hearts of cinemagoers who just want to enjoy seeing them on the screen. That easy-going, exportable charisma was there in Paul Hogan in his heyday and you can see it in the screen presence of an actor like Hugh Jackman or the Hemsworth brothers, a combination of mildness and athleticism with an apparent absence of pretension, angst or vanity. Just as there are Australian heterosexual women who go for exotic, sophisticated-seeming men from overseas, so too are there women outside this country attracted to a certain type of relaxed, optimistic and uncomplicated Australian masculinity, or at least the image of it. Rod Taylor, as noted in Pulling No Punches, in his screen roles seems at ease with women, able to listen and to respond with a natural empathy. There is none of the reticence evident sometimes in the performances of say Gary Cooper or John Wayne. In real life, Wayne apparently was a great mate of Taylor and enjoyed beating him at poker. 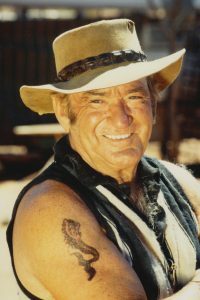 Taylor, whom Wayne cast in The Train Robbers (1973) always paid his debts, with Wayne keeping a framed collection of Taylor’s uncashed cheques. In Pulling No Punches, Angela Lansbury comments that Taylor, with whom she acted (as did Maggie Smith, Jane Fonda and Julie Christie), was both a man’s man and a woman’s man. Not by accident was Taylor early in his Hollywood career cast in romantic comedies co-staring with Doris Day. Those roles that might easily have gone to stars with a strong female following such as Cary Grant and Rock Hudson. In Alfred Hitchcock’s The Birds (1963), Taylor is paired in the central romantic relationship with Tippi Hedren in the type role that in other Hitchcock films is played by the likes of Grant or perhaps Gregory Peck. Hedren, who has spoken publicly of being sexual assaulted by the manipulative Hitchcock, speaks warmly of Taylor as a man and as a fellow actor. Taylor, who in his youth in Sydney was an amateur boxer and surf life saver, had the capacity to deliver maximum violence. Interestingly, Veronica Cartwright, who played a supporting role in The Birds, describes Taylor as “cohesive”, which seems apt. In addition to his work as an actor, Taylor, who trained as a commercial artist, was a talented painter and furniture maker. He was creative without being up himself. In Pulling No Punches, Bryan Brown equates the international acting career of Rod Taylor with a big adventure for an Australian of that era in particular. Like many of the more authentic movie stars, Taylor was not the product of a posh drama school but had done a few different different things and seen a bit of life. So too had Errol Flynn, though Taylor seems to have been more level-headed in handling the pressures of fame. While not a teetotaller, Taylor recalls during the making of jet-set melodrama The V.I.P.s (1963) having to bail out of epic drinking binges with Richard Burton, whose consumption of alcohol was 24/7. At the same time as he could play an urbane romantic lead, Taylor, who in his youth in Sydney was an amateur boxer and surf life saver, had the capacity to deliver maximum violence. There is a notorious fight scene in Darker Than Amber (1970) so full-on that Taylor and fellow actor William Smith had to be pulled apart by the crew with each man suffering substantial injuries. In Dark of the Sun (1968) Taylor plays a mercenary sent into the Congo to recover diamonds from deep in the jungle during a vicious civil war. An action film of horrors and cruelty as well as almost unbearable suspense, Dark of the Sun sees Taylor’s character to run the gamut of emotions from touching tenderness to uncontrolled murderous rage, all conveyed convincingly by Taylor in what arguably is his signature performance. Taylor’s final major role is similarly full blooded. Playing the deranged yet strangely likeable outback patriarch Daddy-O in the Ozploitation classic Welcome to Woop Woop (1997), Taylor, according to the director Stephan Elliott, agreed to complete a scene in which his character tap dances on the electrified bar of a remote country pub despite knowing the pain this would cause his septuagenarian body. The performance, which was filmed in one take and with gusto, left Taylor unable to stand and in urgent need of a hip replacement. Such was the professionalism, as well as fearlessness, of Rod Taylor. Rod Taylor – Pulling No Punches is available on DVD and on demand. Images courtesy of Umbrella Entertainment. A great pity that Rod Taylor turned down the role of James Bond. His Aussie accent would have been at least as bearable as the Scottish accent of the best Bond – Sean Connery, and he would certainly have been more convincing in the role than George Lazenby. But, realistically, who can forget “Hong Kong” and “The Birds”? Yes, Australians didn’t seem to value him like they do today with someone like Hugh Jackman. Earliest days of snowy NBN Channel Three reception though it was – all the way from Newcastle up and over the ranges to 20~30 metre high TV reception antenna towers in Tamworth – we would not miss an episode of Hong Kong with Rod TAYLOR. Just 12 years later I was in that fabled city – not too far changed from the making of that series! Great article – thanks Simon!